Yarmouth designer Alison Bramhall says bright hues are an instant mood booster. Alison Bramhall hates the way real estate agents encourage their clients to paint their homes in neutral tones, as if they are only living for that day in the future when they resell the place. Bramhall, a 52-year-old designer from Yarmouth, has seen what this devotion to dreariness does to people when they walk into her own home, which is painted with the brightest of palettes. They light up when they see that Bramhall’s living room is poppy orange, her bathroom periwinkle, her dining room saffron, her studio lime green, her bedroom cantaloupe, and her kitchen magenta. And her office has zebra stripes on the ceiling. 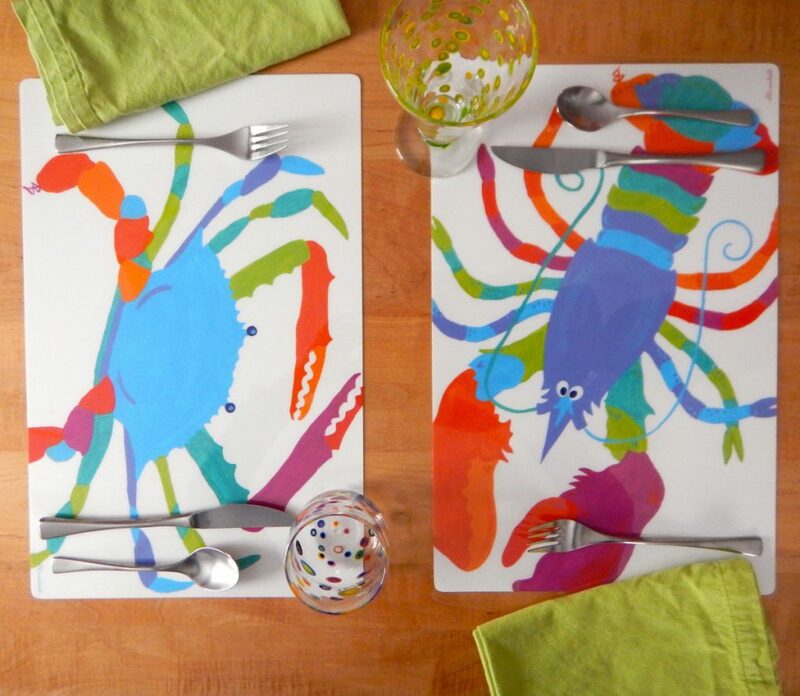 Bramhall, owner of Festive Fish, now tries to spread her version of happiness through the bright colors on her placemats ($14) and other home accent products – coaster sets ($22), cards, charts ($36-$125) and calendars – all inspired by the sea. Her lobsters are not red, they’re multi-colored or painted like a Maiori warrior. Her harbor seal floats in a pool of pink, yellow, orange, green and blue ripples. When she was 14, she started painting and selling barrettes. In college, she painted more than 200 pairs of boxer shorts. Then came baby products, recipe boxes and silk ties. One of her specialties is painting charts that are riffs on government navigation charts. She started with a brightly colored chart of the waters in Ireland where she had once taken a sea kayaking trip, and where she fell in love with the sea foam, the wild horses and the lobstermen who commented on her “wee little boat.” She decorated the chart with Celtic knots and Celtic fish. She liked how that chart turned out, so she made some of the Maine coastline and took them to a boatbuilders’ show. People lined up to buy them and share their own stories. Bramhall sells her work online at festivefish.net, and at outlets such as Skillins Greenhouses, Royal River Natural Foods in Yarmouth, and Maxwell’s Pottery in Portland. She’ll also be at the Yarmouth Clam Festival today and at Art in the Park in South Portland Aug. 11.